Transport Ministry Secretary Dhammika Perera called for the dedication of Ministry officials in order to make the public transport service a better one for the commuters. He made this request from the Transport Ministry officials at a discussion he had with them at the Ministry, soon after assuming duties in his new post. He said that the on-going building work on the North Eastern railroad needs to be expedited, and discussed the measures being taken to extend the railway from Omanthai. The Secretary and Ministry officials exchanged views on how to upgrade the railway network in the Fort, Maradana, Bambalapitiya and Kollupitiya by improving the condition in canteens, toilets, passenger lounges etc. They also focussed on bringing about better facilities for elderly passengers and children using the public transport system. The Secretary also discussed about the difficulties people face at the Motor Vehicles Department when they go to obtain driving licences. 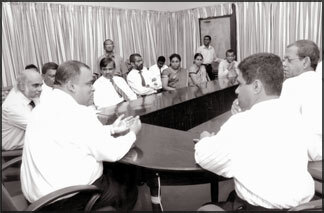 It was decided at the meeting to streamline the system to make all institutions that come under the Transport Ministry. The Secretary inquired into the financial status of each institution and stressed that all action will be taken to minimize losses incurred, and to reach breakeven within a short period, paving way for a situation that makes a decent profit from the services while offering a better service than ever.